In October 2009 Stanford University geneticist Anne Brunet was sitting in her office when graduate student Eric Greer came to her with a slightly heretical question. Brunet’s lab had recently learned that they could lengthen a worm’s lifetime by manipulating levels of an enzyme called SET2. “What if extending a worm’s lifetime using SET2 can affect the life span of its descendants, even if the descendants have normal amounts of the enzyme?” he asked. The question was unorthodox, Brunet says, “because it touches upon the Lamarckian idea that you can inherit acquired traits, which biologists have believed false for years.” The biologist Jean-Baptiste Lamarck​ theorized in 1809 that the traits exhibited by an organism during its lifetime were augmented in its offspring; a giraffe that regularly stretched its neck to eat would father calves whose necks were longer. The idea was largely discredited by Darwin’s theory of evolution, first published in 1859. More recently, scientists have begun to realize that an organism’s behavior and environment may indeed influence the genes it passes to its offspring. The heritability of those acquired traits is not based on DNA, but on alterations in the molecular packaging that surrounds a gene. When Greer approached Brunet in 2009 with his question about worms and SET2, such “epigenetic” inheritance had only been discovered for simple traits such as eye color, flower symmetry and coat color. 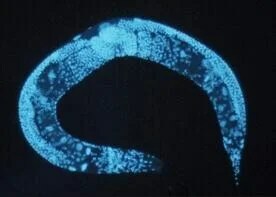 The study used Caenorhabditis elegans worms with very low levels of SET2. The enzyme normally adds methyl molecules onto DNA’s protein packaging material. In doing so, the enzyme opens up the packaging material, allowing the genes to be copied and expressed. Some of those genes appear to be pro-aging genes, Brunet says. Her team knocked out SET2 by removing genes that code for it. This had the effect of significantly lengthening the worms’ life spans, presumably because those pro-aging genes were no longer expressed. Next, the long-lived, enzyme-lacking worms mated with normal ones. The offspring had the regular genes for making SET2, and even expressed normal amounts of the enzyme, but they lived significantly longer than control worms whose parents both had regular life spans. The life-extending effect carried over into the third generation, but returned to normal by the fourth generation (in the great-grandchildren of the original mutant worms). For the first few generations, having a long-lived ancestor increased life expectancy from 20 days to 25, extending a worm’s longevity by 25 to 30 percent on average. The study’s results are also exciting because the genes that code for the life-lengthening SET2 enzyme exist in other species, including humans. Brunet says she wants see if the results can be replicated in vertebrates, such as fish and mammals. Those questions will not be answered for many years, because it is unknown whether the SET2 complex has the same function in other species, and because those species have longer generational time frames. But there could be another reason for the longevity found in certain populations such as the Japanese and Chinese. In these cultures, ancestor worship is common, and importantly, elderly are given much more respect than in other cultures of the world. Being regarded as useful and respected could be a driving factor for the old to live on. In most other cultures world wide, the senior citizens are viewed as a spent force, with little if any possible contributions to society. Being fawned upon by the younger generation who look to them for guidance and advice could well be a motivating factor to live on. Of course this assumes that a person can give up on life and that outlook itself shortens her lifespan. But this is a reasonable assumption. Look around you. Most of the people who are surprisingly fit and perky at a great age are, if you study their habits, people who have some driving force behind them.